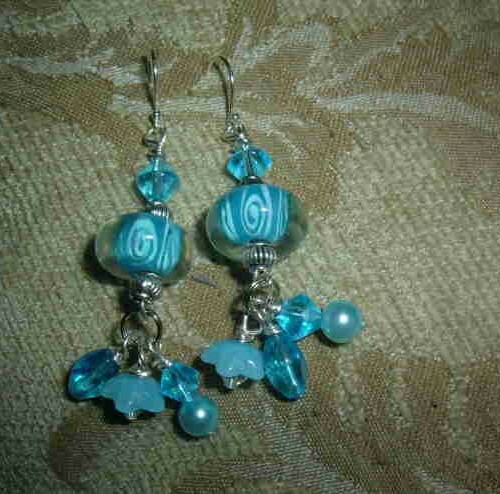 I created these stunning aqua beaded lampwork earrings to showcase the iridescent beauty of the blue glass beads. I chose beads in different sizes, all in the same aquamarine color. Some of the beads are shaped like flowers and others are round or diamond-shaped. I created a petal-like effect by hanging several smaller, different-shaped beads in a fan below the larger beads. I used delicate silver chains to hang the smaller beads all in a row. These earrings catch the light beautifully and are gorgeous, bright and summery. I think they will look especially beautiful on someone with a tan.